Music is the universal language. Music touches everyone, through generations, crossing all boundaries, all levels of emotion and situations in life. This DVD takes you on a journey that answers the valuable questions of any music lover or student has by telling the story of when music originated, what were the first instruments and how they developed over time. 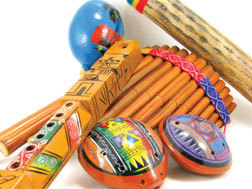 This DVD takes you through the history of primitive man’s development of the first instruments. Primitive man’s ingenuity, need for expression and sound drove them to create the first instruments made from tubes of bamboo, wood, and even bone to create sounds. Sounds called whistles and still in use today such as recorders. You will go on a trip through time that demonstrates the ancient Greeks modifications to primitive man’s tubes into panpipes and finally the processor to a wide range of wind instruments essential to create such beautiful sounds over the centuries. The history of the beginning of music reinforces music is the universal language spanning time, and space.